Unpacked from the show yesterday, and sorted the signed books, about 2 boxes of them. 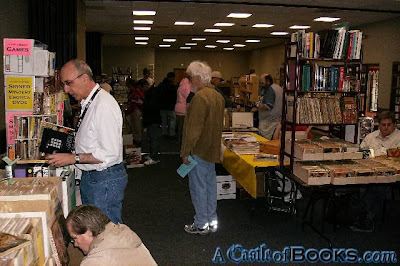 Crowds at Once Read Books $1.00 a book table next door. Not a great show, but look to have made a very minimal a amount profit. Probably not as good as if had been open. But Alicia did manage to get a stack of books signed. Nothing by Bradbury unfortunately. Karen Anderson - no show, heard she was unwell. Ray Bradbury - Huge slow line, 2 PBs only. Made labels for Paperback show display, packed up the SUV, nearly ready to go in the morning. Diamond Comics shipment arrived yesterday, more Anime DVDs, some Graphic Novels, and European Hardcover GNs. A stack of Disney cartoon VHS traded in. Sorted & boxed up books to get signed at the show on Sunday. 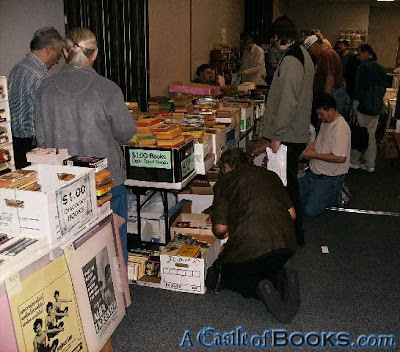 Finished processing vintage paperbacks, and started gathering up and organizing stuff for the show on Sunday. Stayed late sorting stuff for the show Sunday. Processed 2 boxes of vintage paperbacks, lots of mystery & sf, some erotica, metaphysical, crime, and movie/tv covers. Purchased 6 boxes of relatively recently published Religion, History, Science & Philosophy. Sorted & organized the Adventure Fiction, Dale Brown, Coontz, W.E.B. Griffin, etc. Pulled extra copies of Nora Roberts paperbacks off the shelf yesterday - a stack of them on the $1.00 cart now, along with some general fiction & thrillers. Shelved a stack of Hardcover, some General Fiction, Horror, Young Adult Novels, Art, & some Signed Books behind the counter. Packaged up the online orders for shipment on Friday. Adjusted eBay setting for international, and for non-book items. Some piss-ant put a sticker on the armor yesterday, didn't notice it until taking the cart out this morning. It came off ok, but what's wrong with these idiots? Adjusted some more settings on eBay, now trying to get the international shipping to work. Attempted to fix eBay settings some more. Purchased some books on eastern religion. Shelved some books on business, eastern religion, psychology. Sorted more vintage paperbacks for the show coming up at the end of the month. Straightened up cleared the aisles a bit. 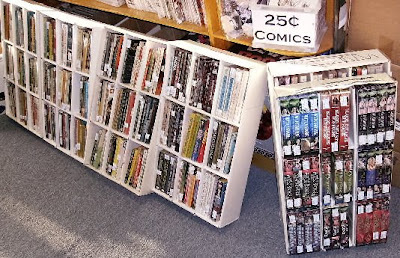 Shelved 4 boxes of Hardcover & TradePaperback books, lots of Cookbooks, lots of Classics, History, General Fiction, Horror, Romance, SF, Fantasy, Entertainment Biography, Crafts & more, most are only $6.95. Put out some more toys and games, stuffed Monty Python & the Holy Grail, and RPG Miniatures. Kathy & Dan stopped by and the wind picked up so strongly it blew the cart around! Turned it 180! Small books flew all across the parking lot. Packaged up the online orders for shipment on Monday. Shelved some Anime DVDs, and some Card Games. Purchased 6 boxes of books on History, Religion, Philosophy and Science the other day. They're in nice condition and some will be shelved soon. Dana brought over a box of comics donations from Once Read Books. Added images to online listings. Shelved 1 box of paperbacks, lots of Romance, some others. Packaged the online orders, but ran out of tape, shipment hasn't arrived yet, guess I'll have to get another roll. Shelved a box of paperbacks, mostly Romance. Installed an electronic AC switch last night. Shelved 3 boxes of mass market paperbacks, lots of Romance, General Fiction & Thrillers, Fantasy and Young Adult novels. Shelved 3 boxes of paperbacks, lots of fantasy, and recent stuff for the racks. New $1.00 books on the cart out front, and VHS too. Shelved a box of paperbacks, a stack of young adult novels, and various other fiction. Processed the Diamond Comics order that arrived yesterday. New Comics: Gunslinger, Buffy the Vampire Slayer, Laurell K. Hamilton + George R.R. Martin. Restocked and put out 3 times more of the role playing game miniatures. Paperwork & figures for taxes. Worked on the tri-fold flyer, figured out how to make a pdf file. 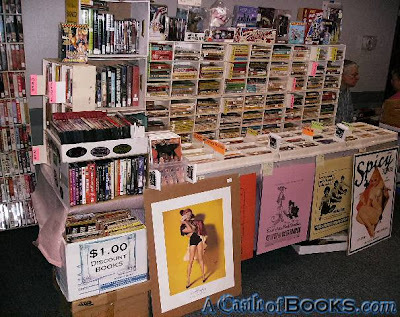 Priced some collectable vintage paperbacks. Shelved 3 boxes of paperbacks. Traded in for a box of New Ayn Rand - Fountainhead & Anthem paperbacks. Packaged up 7 online orders. Left a bunch of Amazon & eBay feedback. Shelved 1 boxes of paperbacks. Organized the crafts - Holidays, Weddings, Body Art, Fashion, Smokes, Dolls & Toys, Quilting, Needlecrafts, Ideals. Packaged 13 orders for shipment on Monday. Finished shelving those Technical & Electronics books from yesterday. Looked up some of the Danish books that came in a couple of days ago. A good sale at the end of the day made it a nice day, a good start to a new month. Been slackin' on the photos, hope to do more tomorrow.